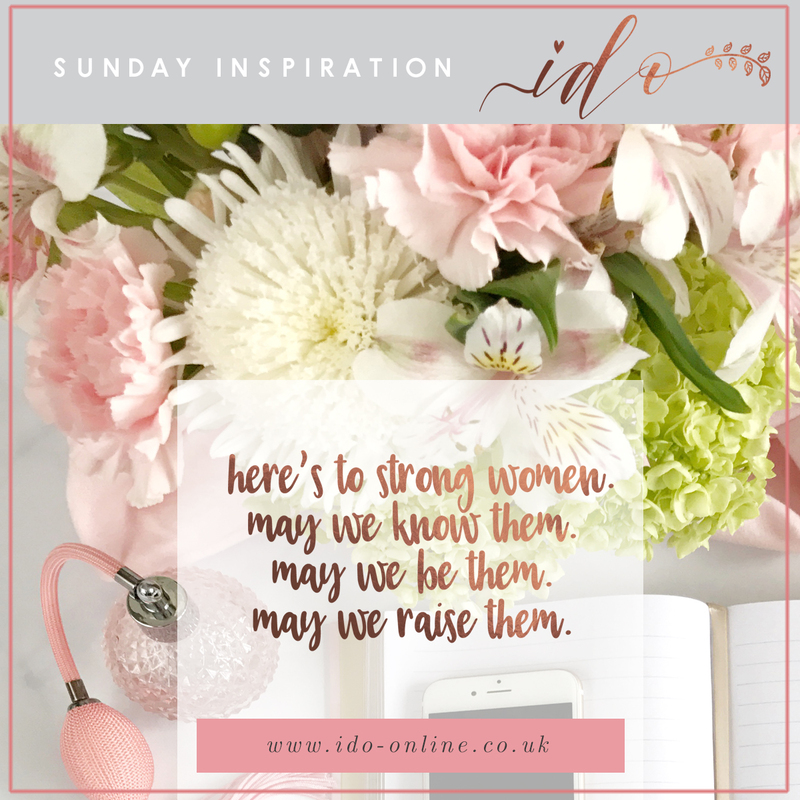 This weeks Wedding Inspiration Sunday is all about us woman! For all of us who have daughters, our wish for them is that they grow into strong, independent woman. Woman who are comfortable in their own skin, confident and able to tackle anything life throws at them. When it comes to their wedding day, all we wish for, is the chance for our beautuiful girls, to have the wedding they have always dreamt of. The one day of their lives, where they are the complete centre of attention and marrying the man of their dreams. 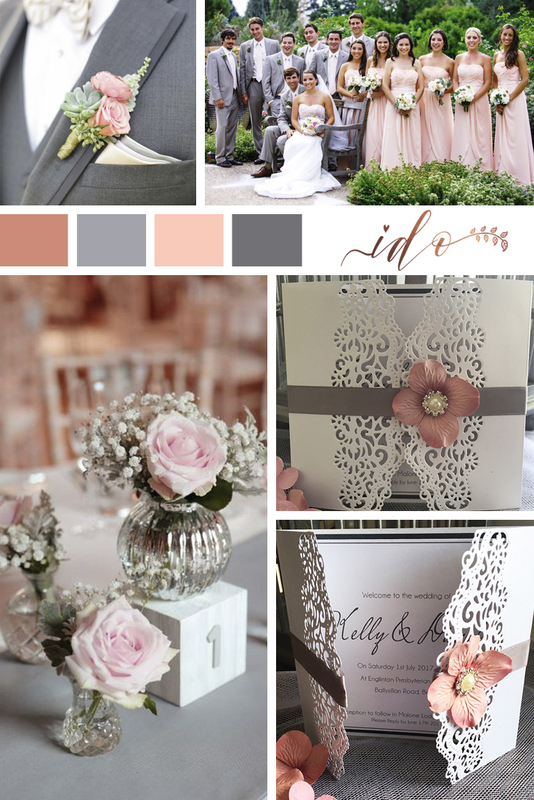 These Invitations were made for a lovely couple who had planned a Pink & Grey Wedding. Consider Grey suits for the Groom and groomsmen, soft pink Bridesmaids dresses. Soft pink roses. Hydrangea, Succulents and baby’s breath floral arrangements. Rose petals, and diamante’s. Glass or Crystal vases on the tables, with white washed or aged grey wooden features and don’t forget the white wicker baskets filled with flip flops. This theme is pretty and delicate, and most definitely feminine. For a lot of little girls who pictured their wedding day, this is, I’m sure, very close to what they imagined. Sunday again! This week’s inspiration board comes from my French Theme wedding Invitations and Favour bottles. If you’re like me and adore French style, Incorporating it into your wedding will be a no brainer. This can be done softly or boldly. 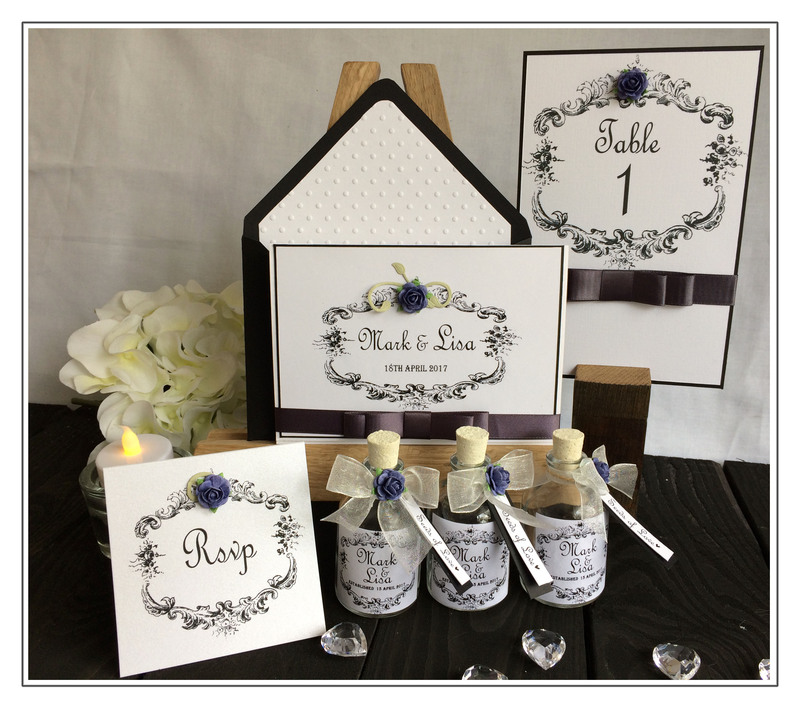 Like these Black & White French Design Wedding Invitations and accessories. Hand embossed dotty card, Black envelopes.. black satin ribbon…White Organza ribbon and purple roses. Mini Glass bottles with corks. personalised tags and labels. 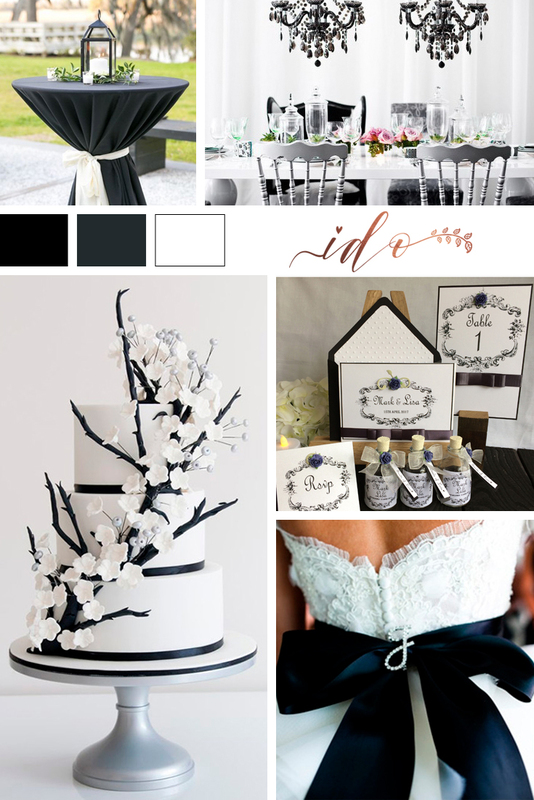 As Black and white are canvas colours, you are able to add any pop of colour to complete this look at your wedding. Sunday Inspiration-Ivory & Copper Wedding. Vellum floral Pocket Invitation. Champagne glitter pull out card. Ivory flower and handmade copper foiled leaves on front. 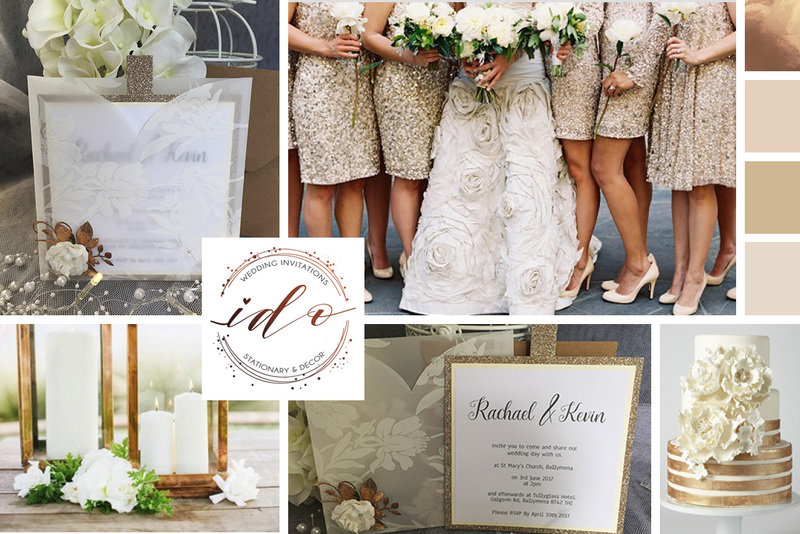 This year, it seems that metallic’s are a popular favourite for Bride’s to be when considering the theme and style for their wedding. 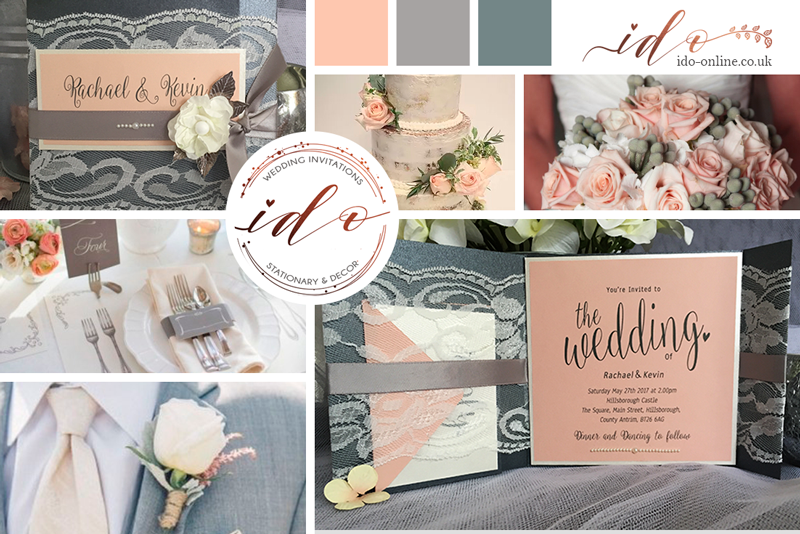 Beautiful colours that are so pretty and feminine, particularly when used for wedding Invitations, so there’s no surprise they’re a best seller. You might consider Champagne glitter dresses for the Bridesmaids, Gorgeous Ivory flowers and copper accents for that special added bling. Gorgeous colours for a spring wedding. Blue grey suits for the men…. Blush pink roses or wild spring flowers. 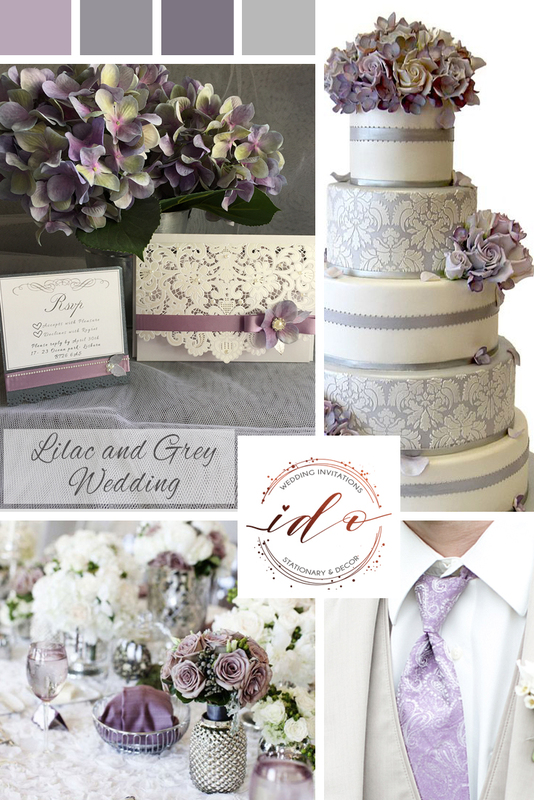 Sunday Wedding Inspiration-Lilac and Grey.